Despite an up-and-down performance from many of the Pistons, Detroit beat New Jersey 76-67 in their Summer League debut. There was good (12 blocked shots) and bad (23 team turnovers), but the Pistons' interior defense, headlined by Andre Drummond, led the team to the narrow victory. Because this is Summer League ball, there's not much use in analyzing the team as a whole, but we can glean a little bit from the players' individual performances. So what better way to synthesize than information that with entirely reductive letter grades!!! It was feast or famine with Drummond who turned the ball over 7 times and missed 7 of his 9 free throws, but dominated the glass on both ends of the court and blocked half a dozen Nets shots. Drummond's skills are well beyond playing in the Summer League. He looked like a man amongst boys every moment he was on the court, even taking the ball to the rim from halfcourt as he weaved through defenders. His flaws were accentuated because of his dominance. The Pistons were posting Drummond on the offensive end only to watch him brick multiple hook shots. And when the Nets went to Hack-a-Drummond late in the game, his poor shooting almost cost the Pistons the victory. Those problems were to be expected in Year Two, and Drummond's talents far outweigh his downfalls. It was a rough outing for the Pistons's first-round draft pick as he went 0-8 on three-point field goals and failed to ever become a part of the offense. However, KCP's athletic gifts were on full display. In the first half, he went strong to the rim for a dunk, drawing a foul as he skied over a Nets big man. He also managed an incredible block after losing his man on the baseline and recovering to save a basket. KCP's hands were everywhere on the defensive end, and though he wasn't credited with any steals, he forced a handful of turnovers. This game reaffirmed that KCP is not going to be a player that dominates offensively, but he showed all of the skills to be one of the NBA's coveted 3 and D players. He spent almost every offensive possession planted in one of the short corners and put up several wide-open threes that clanged out. Though his 0-fer outing was disappointing, it's not too troublesome yet. This is Summer League basketball and his first game to boot. It does, however, signify that he needs to work on his stroke significantly. What watching KCP in this setting showed, however, was his likely NBA comparable: Andre Iguodala. Both are hyper athletic shooting guards in the 6'5"-6'6" mold, were top-10 draftees (KCP 8th overall, Iguodala 9th overall), and show impressive defensive skills. Iguodala still struggles to shoot from range, which KCP was drafted to do, but Iguodala never had the shooting pedigree that KCP has. So Tony Mitchell looked a lot like Josh Smi... oh. Mitchell spent most of the game intimidating shooters and challenging shots. He had two offensive put backs after athletic offensive rebounds and hit one long jumper en route to 7 points. Mitchell paired with Drummond to form an intimidating frontcourt that the Nets struggled to consistently break down. He was credited with only two blocks, but he rose up with Drummond on multiple occasions only to see Andre swat the ball down first. Middleton may have been the surprise of game one for the Pistons. He showed a significantly improved stroke from last year and played aggressively, attacking the basket, pulling up for twos after creating space, and spotting up for wing threes. Middleton was a second-round flier last year that didn't see lots of playing time, and when he did, struggled to make an impact. His turnovers, especially early, were troublesome but they may also be a function of jitters and getting acclimated to the speed of the game again. Players typically show the greatest improvement between their first and second year, and if Middleton can provide this kind of performance game-in and game-out, the Pistons may have another promising young player on the roster, this time occupying the elusive wing position. Siva was as advertised: An offensive nonfactor but a rabid on-ball defender. In the open court, Siva harassed ball carriers but it wasn't until players got into the thick of the defense that Siva proved his real value. Players struggled to get a step on Siva and he used his exceptional positioning to poke balls loose. For as good as he was defensively, his offensive game showed obvious deficiencies. Defenders sagged off of him all game and went under pick and rolls, challenging him to shoot which he never did. English was the first man off the bench and provided a small offensive spark in the form of some outside shooting. English looked similar to his rookie campaign where he was a rarely-used spot-up shooter. He spent more time attacking the basket against the Nets to no avail, often throwing up contested, no-prayer layups. His lack of noted development points to future struggles seeing the court. Kravtsov was all over the court in this game, finishing strong around the rim and challenging Nets shots in relief of Drummond. That there wasn't significant falloff after Drummond left the game bodes well for Kravtsov getting minutes when the season starts. Though most of those will be eaten by some platoon of Josh Smith with Greg Monroe/Drummond, Kravtsov's apparent development is promising for a backup big man. I was worried that Kravtsov's $1.5M contract was going to be wasted on this team, but he may prove to be a useful role player in limited time. Lucious was a Michigan State castoff due to "actions detrimental to the team" or some such logistical BS that amounts to "got caught with weed too many times". He's basically on an extended job interview that did not get off to a great start. 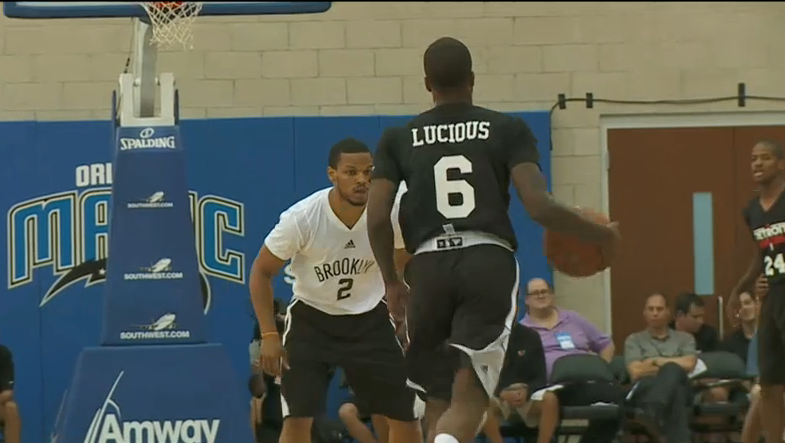 You could see that Lucious was struggling with the speed of the game and couldn't facilitate on offense. He hit a couple of three pointers, but the Pistons Point Guard That Can Shoot But Not Distribute is currently occupied by Brandon Knight. Peterson played the role of "What enormous white guy is that who isn't Viacheslav Kravtsov". Peterson simply existed on the court. With a logjam at PF/C, Peterson is basically auditioning for another team. He'll probably end up in Europe. Why have one Singler when you can have two? Because the second one isn't very good. EJ looked like his brother with less of a nose for rebounds and no clear offensive strategy. He's just here to make it a family affair. All in all, this was a solid outing for the Pistons. They had a relatively clear offensive strategy (high pick and rolls with corner shooters) that allowed them to run a fluid offense, and the defense looked as stout as ever. It'll be interesting to watch how the young Pistons develop throughout the summer.